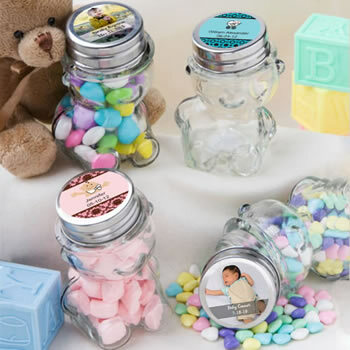 Perfect as baby shower favors or for any baby themed occasion, these jars are clearly sensational! Sold only by Fashioncraft, each 3 .5" x 2" Personalized Expressions Collection glass jar favor is shaped like a cute teddy bear topped with a screw-on lid fit for easy application of the personalized label of your choice. From assorted color combinations, to adorable baby themed designs, to your own title, you can design your label to make this favor a "just for you" memento of your special day. Sold bulk packaged, these teddy bear jars are sweet as honey! Personalized labels are self-sticking for easy application. Please allow 3-4 days for production. We loved them. They were delivered way before the requested date and were tightly packed. None of the bottles broke and the labels were perfect too. We used them for a baby shower and had ordered 160 of them. Everyone loved them. Thank you so much. Will be using this website again. Perfectly priced too. These Teddy’s are so cute. I ordered 120 for baby shower favors. Only two broke during shipment and replacements were sent immediately. The labels came out exactly how I wanted them too. I received my order very quickly and although there were 2 broken jars ...they were replaced immediately. I liked this only wish the sticker that come with were waterproof or more Permanent. After reading a few negatives reviews about broken items, I decided not to place an order. Giving it some thought, because accidents can happen and I do believe everyone deserves a chance, I placed the order and was glad I did. Yes, I did receive broken teddy bears, but when I called and shared the problem they immediately got on it and replaced those that were broken. Thanks for your efficiency. I will not be reluctant to order again in the future. I ordered 50 of the bear shaped jars. They arrived promptly. The packaging could have been better. 8 were broken. However after emailing the sight I received replacements very quickly. I would purchase from here again. 4 of the 80 bears arrived broken. Other than that the of arrived on time and were super cute. I really love the bears! The size is perfect and the label colors came out exactly the way I wanted! Unfortunately when they arrive one of the bears were broken and now My count is off because I am short one. As a result, I can’t give the 5 stars I would have given. I ordered 100 of teddy bear jars, it was out if stock but they shipped right away on the date that it will be available. I got it after two weeks but 14 bear legs of jars were broken I emailed them and replace the jars and have it in a week. Will definitely recommend. Very satisfied. Appreciated by all. Arrived early and in great condition. Good quality. These are the cutest party favor! Easy to add a ribbon for whatever your event. We added a cute blue ribbon for my grandson's baby shower. I filled it with Teddy Grahams and my guests loved it. Excellent value and great customer service. They came exactly as pictured and was a big hit with my guest at the teddy bear themed baby shower. I did order 6 extras because previous reviews said some came broken. I only have one that was broken. Will definitely order from here again!!!! Loved them, but was unable to open eight and one came with a broken nose. Even had my husband try to no avail. After I tried to put the lids back on the others, I had to be careful or they would be difficult to reopen. They were perfect for our baby shower. We put pink m&m's in them and then went to a party store and found a little wrap around with a pacifier hanging off it. Everyone loved them. The Teddy Bear jars were perfect for my party favors. They were easy to fill and the labels on the top were a terrific reminder of the day. My guest loved them and I loved the price. It was so easy ordering them. I will for sure use nice price favors again and again. I ordered these teddy bear jars and they came quick and packaged well and in great condition. My only complaint is that they smelled like metal so I had to wash them before use and let them air dry. The tops I dried with paper towel and found that there was a lot of black/silver dirt almost metal like on the paper towels. Other than that it made the perfect party favor for the candy shells that I put in them. The labels came in the package and I was given more than enough. It could have been because some rows with labels were messed up, but it made up for it with all the extra sheets of labels that did come out good. I would use this site to order from again, but maybe not the teddy jars next time. Too much work, but very cute. Loved them!! Awesome product for the price!! Great purchase and the labels all came out beautifully. A nice addition to the favors given to children. We filled them with gummy bears and each kid had a treat of their own to take home. I will order from you again.